Online sellers concerned that they are paying more to send a package to US shoppers than their Chinese counterparts have an opportunity to weigh in on the issue of international postal rates. The Postal Regulatory Commission (PRC) must review proposed UPU Terminal Dues rates for 2018 - 2021 and submit its view to the State Department, which oversees negotiations on international postal rates with other UN members. Terminal Dues are complicated and may not sound very exciting, but they are having an enormous impact on ecommerce in this country, and on small sellers in particular. Shipping costs are huge issue for online sellers, and according to Pacific Standard magazine, "A comprehensive study by the research group Copenhagen Economics has found that the misalignment of terminal dues rates is leading online shoppers to order directly from countries with favorable UPU positions, rather than from suppliers closer to home - even if the price of the item itself is identical." One expert believes the discount for the new proposed Terminal Dues rates for mail from Hong Kong, Singapore, and China will improve (from a US shipper's point of view) from the current level of about 70% to about 50% by 2021. The PRC is seeking comments on both the general process and on specific rates, but you only have until 4:30 pm ET on July 21 (Thursday). Here's the docket on the PRC website. Your comments will be made publicly viewable on the PRC website, here are instructions on leaving a comment. Look for more information in our coverage of UPU Terminal Dues in tomorrow (Wednesday's) Newsflash (available now). Anyone who continues to have problems can call her at the main number, 202-789-6800, or her direct line at 202-789-6845. Mary is extremely friendly and helpful, so don't give up. UPDATE 7/21/16: See today's Letter to the Editor for detailed information on posting a comment on the PRC website. I can't post on the ebay forums! Has anyone posted this info over at selling aka seller central? I don't think much of this will matter at all in a year - Chinese products will come in by the container not just to the West Coast, but now, with the opening of the Panama Canal, expect a flooding of Chinese products to China Owned warehouses on the East Coast as well. It's always been my opinion that the road to success is to become the source of the product ( ie: produce/manufacture something ). Competing in a 'race to the bottom' where everyone is selling the same product, Chinese or not, only to cry foul when the manufacturer enters the same market you sell in isn't logical as competition from the source is inevitable. When did ebay ever listen to us. So, they'll continue to give the Chinese free postage and the site will continue to be full of junk and they'll continue to wonder where all the good sellers are. I gave up long ago, i just don't fall for childish stuff anymore. I know as a seller, thankfully, i don't need ebay and as a buyer i only check out ebay when I can't find what i want on Amazon. I purchased something from a Chinese seller. They paid $18 to send it to the US with tracking and signature confirmation. They sent the wrong item. The cost for me to return it to China, with tracking, was almost $100. This was the same item they sent in the same package for only $18. How is that fair? This was not an ebay purchase. I think it's unfair as a seller and as a buyer, that I have to pay so much more for shipping to other countries than those countries have to pay for shipping items to us. I will never buy anything from an overseas seller again. I agree with thebobman the main problem is what it costs to ship out of the US. I had a potential buyer from Germany today write to me that he LOVED my product--but that the SHIPPING was stopping him form buying it. I have no idea how MUCH eBay is SHOWING him to ship the item--and of course ebay doesn't want to show us this--but I went and looked and the cost is between $22 and Infinity apparently----surelky more than the $40 price tag. So I asked the guy to text me and maybe we can work something out. Since eBay tries to force us to use Registered and Insured Priority Mail International---which in this case would be at least $60+---you can see the issue here. Well that was--Fun! As soon as I get out of Law School I will get right on trying to use that web site to "File" anything telling whoever is asking that I object to these postage rates. Read like one of those :User Agreements" that no one reads and no one understands and no one could possibly defend themselves from. Absurd--was this meant to be some place where an ORDINARY CITIZEN could actually MAKE THEIR VIEW KNOWN???? What does Ebay have to do with the USPS postal rates for the Asian sellers? Ebay is not giving them "free" postage. You need to look to Congress for that. You were / are upset with the WRONG entity. I respect your frustration about the Asian sellers on Ebay, they hurt many US sellers. But the problem regarding the sweet deal they have with USPS has nothing to do with Ebay. What i noticed is it cost about 13 bucks just to get in the door to ship something to china or anywhere else across the pond using simple postal service, but them to us is somehow free or nearly free as i'v bought stuff from china in the 2 to 10 dollar range with free shipping. I know that some companies take one for the team, but the sellers have hundreds of items so it does not make sense. This only applies to stuff that requires a customs form, simple letters are pretty cheap still. I've been playing the Chinese game for quite awhile now and I don't think I'm the only one. I buy all kinds of chinese crap for $.01. Try to buy the biggest junk you can find because it will arrive in a big shipping envelope (dah free) They always leave excellent feedback immediately when paid - ebay LOVES good feedback. And you get some little junk - I look for crafty things - I'm a St Judes volunteer and we do some childrens events and I donate the things to the kids for crafts. So for $.01 I get great feedback - a free shipping envelope - and some little thing. I keep thinking I will drive them bankrupt but apparently those Chinese idiots keep making crap and shipping it over. Pashaw - and ebay wants me to buy shipping envelopes - ha! WE can't wait for the government to fix this mess. We can only do what We can and not buy the stuff. I don't bother even trying international sales. The cist is prohibitive and I don't see anyone stepping up to the plate to absorb any of MY risk. What I see in this day and age is that if you are a powerful organization or a behemoth retailer or business with connections to politicians you have a voice. If not, forget it. Call me jaded. As Watching the Wheels stated--don't buy the stuff. I can't think of a better way to make a statement. These smoke filled bar room deals are made by idiots that have no clue to what kind of hurt they are putting on Americans. They could care less as long as it lines their egos. There is no end to the politicians stupidity and arrogance. Nothing will be done about this now or ever. One has to be a moron to even think that any american has a voice in anything anymore. Americans are lead around with nose rings. They vote as they are told. As one person, we are powerless. Perhaps ecommercebytes can present our case for equal postal rates with foreign countries. I can't get through the naming garbage on the PRC site. For now, I CANNOT ship internationally. And I have little choice but to buy from China, since US manufacturers are running away due to government regulations. Miniac reminds me of a thought that I have had many times. In this day of powerful social media, why haven't angry eBay sellers (the noise as we are called) organized and put pressure on eBay (and their board) to make change and also put pressure on the media to report sellers' grievances and expose eBay's questionable and unethical (one might say corrupt) business practices. We need someone with the moxy, energy and gumption of Norma Rae to lead this effort. 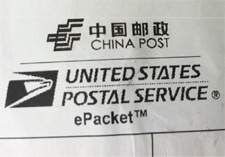 Just a reminder about eBay's involvement in the PRC's implementation of the current e-packet rates. These rates were proposed, implemented, and approved under former Postmaster General Patrick Donahoe, brother of the former eBay CEO John Donahoe. You really need to take off your ''eBay blinders'' and recognize that the current lopsided deal with Chinese postage rates has absolutely nothing to do with eBay. Marie has it at least partially correct in that its government and not eBay that set the rates. Problem is, it wasn't Congress either. The current rate deal that everyone is complaining about was set into place by none other than Hillary Clinton when she was Secretary of State (funny how the main stream press never addresses these types of back-room deals). Lest you doubt this, do some research on the subject. For those of you that have been selling online (including eBay) since back around 2000 should stop and think when did the problem start? Try late 2010, when the current rate structure started to take effect. Face the facts people: we now operate in a global economy and your primary competition is being shifted from the guy or gal next door to the guy in China. The US small business owner is under assault and our days may well be numbered. We're already competing with people that make 1/10th or less per hour than what is our current minimum wage in this country. Just imagine how many more jobs will be pushed overseas in this country if the minimum wage rate is doubled? For any of you that actually have employees, how many of you can truly afford to pay them 5, 6 or $7 more per hour and still remain competitive? How many people can you keep on if your wage costs go up 50, 75 or 100%? Stop, think and pay attention people. We're in an economic war right now and we're losing ground day by day. One other little thought to consider: don't any of you find it the least bit "funny" that this story/issue comes to the forefront a mere 48 hours before the deadline to voice your opinions?